Presentation Zen: PowerPoint printouts used for communicating battle plans? PowerPoint printouts used for communicating battle plans? Thomas Ricks' Fiasco went on sale at the end of last month. The book is a "...hard-hitting indictment of the Iraq war...with compelling specificity" according to the publisher. Ricks, a senior Washington Post Pentagon correspondent and award-winning journalist, says in the book that "...under Rumsfeld, Wolfowitz and Feith, the Pentagon concocted 'the worst war plan in American history.'" You can watch an interview with the author here on the Amazon website. You can also see an interview with Ricks here on C-Span2. In this MSNBC piece, the interviewer says the book "...will likely become the definitive account of our [US] war there." Reliance on slides rather than formal written documents — sound familiar? It should. Remember the findings of the Columbia Accident Investigation Board in 2003? "The Board views the endemic use of PowerPoint briefing slides instead of technical papers as an illustration of the problematic technical communication at NASA." 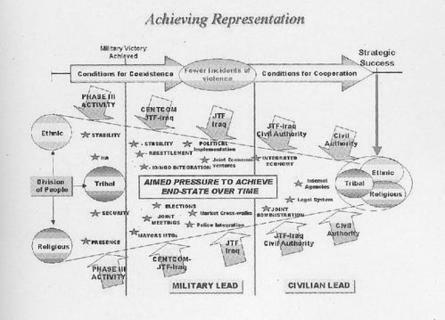 This image below is apparently of an actual slide that Joint Task Force IV used to show how the occupation would work. Could this work as a stand-alone document? Bad presentations are one thing. They are certainly a waste of time (that's perhaps the least harm they do). But even in the worst of presentations, if we really need to know the answer to something we could interrupt or ask the question during the Q&A. With documents and handouts, of course, we have no such luxury. If a document is poorly designed and poorly written, where do we go to get a clarification? And if the document is crucial — even a matter of life and death — is it not paramount that the document be easily searchable with the appropriate depth of data and information? At no time should the reader be saying to themselves: "WTF!— what does this %#@*! mean?!!!" It is just plain stupid to use projected slides (i.e., visuals) used in a live presentation as a document to be read later by people who did not see the talk. Surely the military knows the difference between on-screen visuals used in a live presentation and important documents and reports to be read and referenced in the field. • "PowerPoint slides are...not the conversation itself." • "PowerPoint slides are not self-evident." I have talked about this here many times before. For example: "Slideuments," "Handouts can set you free," "Presentation documents and writing for non-writers," "The sound of one room napping," "Are we asking the right questions?" Says the Arms and Influence author: "In a PowerPoint presentation, the speaker can pick up the slack during the presentation itself, or during the Q&A section at the end. In combat, no such opportunity to ask basic questions like, What did you mean by that?, presents itself." Out of curiosity, I went to the US Department of State website to see if I could find any evidence of poorly made documents there. 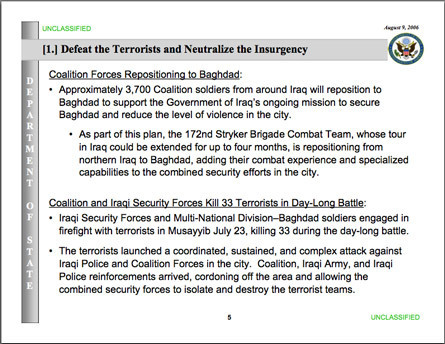 Sure enough, if you download the weekly Iraq Status Reports you will find that they are not written papers with appropriate graphic support and detail but PDFs of "briefing [PPT] slides." The Department of State says that these reports (series of slides) give comprehensive "updates in the eight key areas identified as pillars of U.S. Government policy." Why are these status reports made in PowerPoint? These would make ineffective visuals and they make for an even worse document. Apparently the allure of PPT is too hard to resist. Why on earth would they not use a word processor or page layout app to produce their documents? Why allow the "cognitive style" of slideware to influence the flow, organization, and depth of a status report? Surely the status reports on the War in the Pacific during World War II were of better quality? Above: a sample slide from the August 9, 2006 Iraq Weekly Status Report (Bureau of Near Eastern Affairs, US Department of State). The legendary Alan Kay, the father of the graphical user interface, has said in the past that much technology is a kind of "inverse vandalism" — that is, the making of machinery or tools just because we can. Does this not apply to *using* technology as well? Do we print out PowerPoint slides because "we can" or because "it improves things"? In the end, I don't think PPT is the cause but rather the symptom of a very large and very complex communication problem here. Tools that make work easier don't substitute for talent. Does powerpoint (the design of the software) encourage such behaviour? You say a word-processor document would be better. If the author doesn't get 'it'... that document also might turn out to be confusing. Amen, Met. You are absolutely right about that! I think that is a problem with education today -- too much time spent on teaching digital tools (which is important too) and not enough time on the thing itself (drawing, language, writing, music, math, design, etc.). I wonder if it laziness and not education that's to blame. Not so long ago, maybe a decade, it was clearly understood that important complex information was detailed in a written report in grammatically clear, concise English. If the information from a report was to be presented to an audience, the author would then create a separate presentation document. This document was mainly to provide the speaker with a reminder of his/her key talking points and to illustrate some of the messages in the presentation more graphically for the audience. This however, meant creating two separate documents and each one was time consuming when done properly. I think that at some point in time someone became lazy or maybe just time constrained and only prepared a slightly more detailed version of a presentation and this caught on like wild fire and unfortunately became acceptable since it cut the time to complete the briefing and presentation in half. Hopefully PowerPoint "reports" are one of those awful trends soon fated to die a quick death--like pet rocks. I think the idea of an easier (or lazier) way to do things is the most likely reason people rely on producing Powerpoint reports. I also think they fall between two stools by trying to satisfy the details required for people reading later and the overview provided by the slides for now. This website contains Amazon affiliate links to products I use and recommend, which means that I receive a small commission on the sale of books and other products featured on the site. I only recommend books or other products which I have personally used unless otherwise noted. The purpose of this website is not to make money, but the small commissions do help to pay for the support of this website.